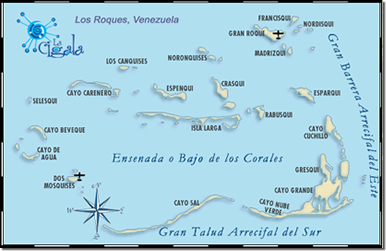 Caracas is the major gateway to Los Roques. From there, it's just approximately a 40-minute hop to El Gran Roque. From the U.S., carriers that fly to Caracas from either New York or Miami include: American, United, Delta, Continental, and Aeropostal. Adjacent to Simon Bolivar International Airport is the domestic terminal where you can take the flight to Los Roques with Aerotuy, Aeroejecutivos, or Sol de America. Most of these airlines conduct several flights during the day, starting at around 8:00 A.M.
Once in El Gran Roque, La Cigala is the first posada you will encounter on your right as you leave the airstrip.